Simple yet powerful, Serato Video is taking big strides forward, especially with its integration into the core code of Serato DJ, which itself is a huge advance on the previously divided world of Serato ITCH and Serato Scratch Live. If you’ve always wanted to dabble in video DJing, this is a great place to start. What you’re actually seeing is Serato Video integrating itself in the main Serato interface, and as someone who’s not used it before, this is what I liked so much about it: For all the extended features that you get out of it, it’s still an app with a tiny footprint that hardly changes your workflow, a comfort for long-time Serato users who may be thinking about dipping into video DJing. 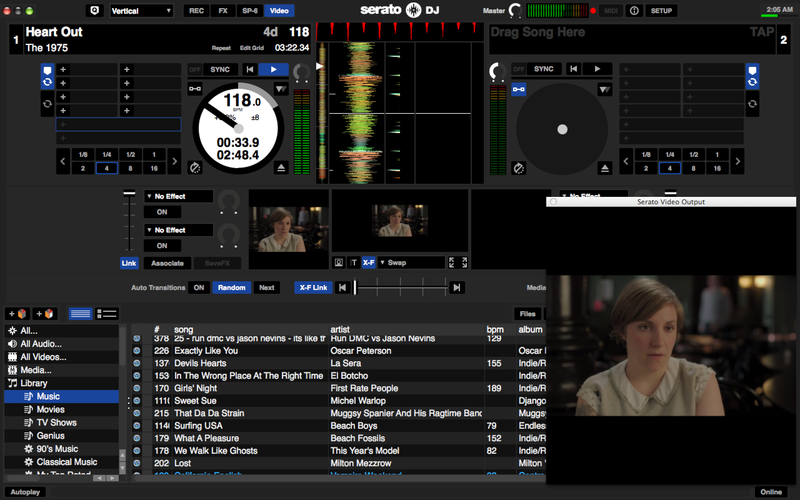 Serato Video appears in the middle of the main interface, so there’s no switching between screens and other confusing workflow tweaks: It’s still Serato through and through. Simply drag a video clip on to the bottom window on either side of the screen, and the clip links itself to the music that you have playing back, allowing you to manipulate the video in parallel with your music (eg when the music stops, the video stops as well. When you execute a baby scratch, the video “baby scratches” too, etc.). This is ideal if you’re playing a track and you have some visuals loaded in your computer that you’d want to display along with it. If you want Serato Video to play the same visual whenever you load this track, simply press the “Associate” button, and it loads the video automatically the next time you play this track. Neat! Conversely, you could also drop a video file onto the decks on top where you would normally load your music and you could also perform the same audio-visual manipulations, meaning instead of loading two files in one deck (the music and the video), you’d just have to load one. This is perfect for playing songs with video clips that you’ve edited together and rendered as a movie file, and even dropping actual music videos (remember MTV?). The Serato ethos of simplicity isn’t lost with this plug-in: The crossfader and upfaders are linked by default to the video plugin, meaning whenever you mix to the next song using volume fades or a crossfade, the next visual “fades” in onscreen as well. This is as no-frills as video mixing gets, and for general use you could practically use it as-is without having to fiddle with settings, provided you have enough video material with you to last the entire set, of course. Of course you can do more by tweaking parameters within Serato Video, and there are a ton of transitions and effects to choose from. You can specify what kind of transition behaviours you’d like Serato Video to do when you’re mixing two songs (eg Additive, Difference Fade, or a George Lucas-esque Screen Wipe). Video lets you tell another story alongside the music that you have carefully chosen to craft one immersive, cohesive experience. In this example, I am mixing one of my favourite Swing Jazz tunes with visuals from one of last year’s Hollywood fantasy blockbusters juxtaposed with a modern linear Quartz composition. Yes, those are actual words! In addition to that, you can also specify what kind of effects you’d like each individual deck to have have. You can have up to two simultaneous video effects per deck, both with a Dry/Wet knob. If you like a particular set of effects for a song, you can just click SaveFX, and they’re dialled in whenever you load that track automatically. If you’re interested, the latest Serato Video documentation has a detailed look at all the available effects. 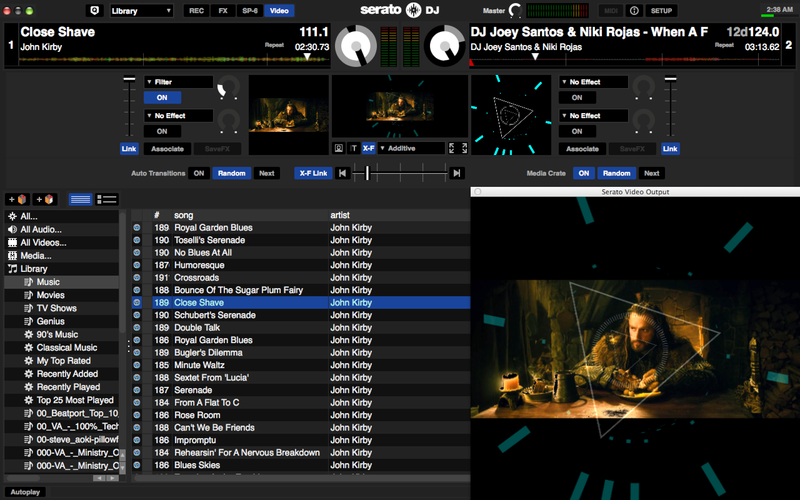 There are a ton of video deck and transition effects in Serato Video, all designed to gently modify or mangle your visuals as you see fit. You can customise the way your controller interacts with the buttons, knobs and faders in Serato Video via the Midi assign mode, allowing you greater controller over the way your visuals are presented without having to reach for your computer keyboard. Also new to this version of Serato Video is the ability to record your video sets as you would a mixtape, which is perfect for uploading on YouTube or as part of your press kit as a video DJ. Syphon support has also been integrated, allowing Serato Video to send out data to other video apps such as Resolume Avenue and other 3D mapping software. I was always hesitant about getting into video DJing because I had the impression that it would be a complex endeavour. After all, I thought, I’m mainly supposed to be focused on providing music for a great dancefloor experience. In my case my mind has been changed by two things. Firstly, the DJing landscape in 2014: With the “democratisation of DJing”, thanks in no small part to the birth of digital DJ software, it becomes harder and harder each year to step out and get noticed among the sea of other controller-wielding DJs. By integrating video into my set, I figured, I give myself the chance to be set apart by offering a value-added service that isn’t usually rendered by other DJs. 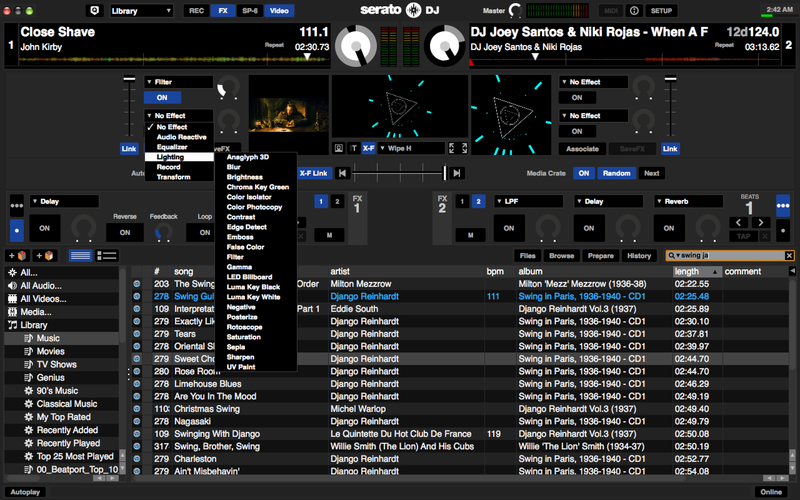 In tandem with this, though, is the fact that Serato Video is so simple to integrate into a DJ’s normal workflow. It gives you the opportunity to experiment with video in a cost-effective package that is easy to use and quite powerful once you’re set up. 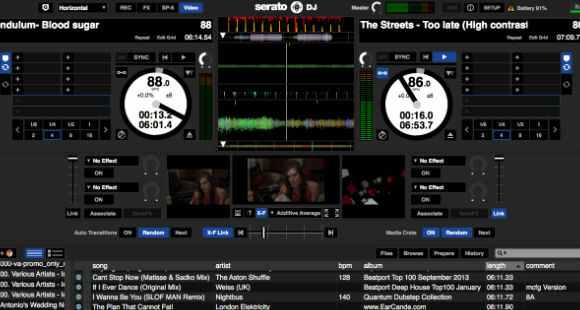 While for many VJing has traditionally been seen as a bit of a distant relative to DJing, Serato Video’s improved integration with Serato DJ is a big step towards those walls being torn down. Maybe now’s the time to take advantage of that fact before VDJing becomes as common as the sync button on your DJ controller!